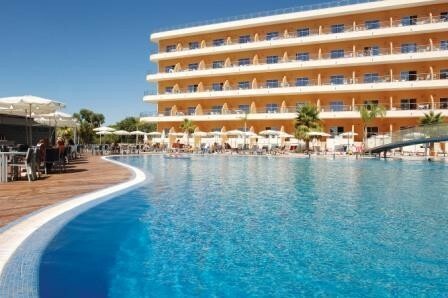 Located to the east part of Albufeira. 138 one-bedroom modern apartments. Restaurants - Pools - Kids Club - minigolf - multisports -games room - shops - Health Club. Online special discount. 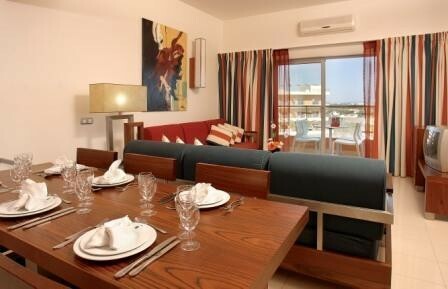 The Hotel Balaia Atlântico Apartments located slightly inland and to the east of Albufeira, in the Algarve. It was constructed in 2005 and is furnished in a modern and pleasing manner using light and bold colours. There are 138 One-Bedroom Apartments and all equipped to sleep four persons by using a convertible sofa in the living room. The apartments all have a sea or pool view and are air-conditioned. Furnished with modern and practical fittings including, satellite TV, Internet, safe and an ample terrace for sun-bathing. The kitchenettes are bright and cheerful and fitted with Danish units including a hob, oven, microwave and coffee machine. The facilities of the Hotel include the 'Al-Fagher Suite' and 'Panoramic' restaurants, a snack-bar by the pool, the 'Al-Buera Bar', swimming pools, a 'Kids Club', tennis court, mini-golf, multi-sports court and games room. There is also a Health Club with a gym, a steam bath and a Jacuzzi. A Shopping Mall with a mini-market, hairdresser, gift shop and a tea room compliments the facilities available. The Hotel provides a Courtesy Bus to ferry guests to and from the nearest beach at Olhos de Água. The same service is also provided to take guests to the centre of nearby Albufeira. This air-conditioned apartment has a private balcony and a kitchenette with a microwave.